The bright May sun beaming through the window of my beauty shop created a stripe across the black shampoo bowl. Every day the ache in my heart reminded me that Eve’s Clips was my life now. 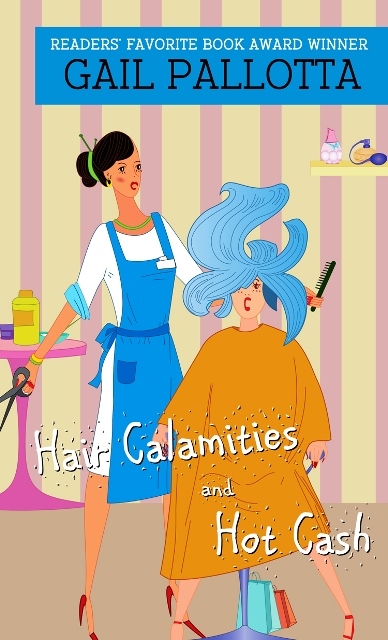 I leaned Joyce Westmoreland’s head back and scrubbed her blonde locks. Then I reached for the conditioner on the metal shelf behind the shampoo bowl. The bottle was empty, and it was the last one I had. That ne’er-do-well Durbin Brown hadn’t delivered my products. A breeze hit me in the face as the door swung open, the pink flowered curtain flapping. “Hello, where have you been? You were supposed to come on Monday.” I held out the container. “I’m out.” My insides boiled at such bad service, not to mention that my creepy new salesman reminded me of Ichabod Crane. He plopped down several cardboard boxes, ripped the top off one and handed me Strawberry Fields Conditioner. The building shook. Metal crunched. Bricks fell amid loud scraping. My nerves vibrated. Durbin’s mouth twitched. Joyce bounded out of her chair, her blue eyes wide. Joyce shot to it like a bullet, but Durbin froze. I grabbed his spindly arm and pulled him behind me, the heels on his black boots scraping across the gray laminate floor. “Get under here.” I couldn’t help but use a harsh tone. He hunkered down, and I scooted beside Joyce. He nuzzled into my shoulder and shivered like a wet puppy. My head spun as the walls shook, shards of glass fell, and sheetrock dust trickled into the air. Finally, the structure stood still and quiet. I crawled out, and my legs nearly buckled under me. Joyce and Durbin followed. Then we all turned toward the window. My heart sank and landed like rock in my stomach. A blue car stuck through the wall and lower portion of the large glass pane. Character Interview with Eve and Philip. Eve: Hi, I’m Eve Castleberry. I lost my husband to a drunk driver and I’ve been lonely ever since. My life revolves around Eve’s Clip’s, my beauty shop. Philip: I’m Philip Wells, a stockbroker. I came to Triville, North Carolina, to service a new account for Make More Money. I can’t believe my new client owns his own mountain, but that’s only one of the many things that have taken me by surprise in this small community. Eve: I live in Triville because I grew up here. I dated Jordan Castleberry in high school. Then we married, and I opened my beauty shop. I wouldn’t think of living anywhere else. Philip: I’m from New York. I grew up there, found a job after college and started work. E: I’m don’t understand how I could love someone else if I’m still in love with Jordan. P: I’m a spur-of-the moment kind of guy, working and playing hard. Life’s not to be taken too seriously, but if I see an opportunity I take it. Name two things you would hate for people to know about you? E: It makes me jealous when Bonnie Sue flirts with Philip. I’ve not cared for Durbin Brown, my new beauty supply salesman, since the day I met him. P: I try to like Valerie Klingman, a large investor at Make More Money and one of my best clients, but I can’t. I get tongue-tied around Eve. Tell us about your special lady/bloke. What makes her/him special? E: Philip’s a good-looking guy, and he’s very smart. His company wants to secure Mr. Jacobsen’s business really bad, and they sent Philip to do it. Wow! He’s even too smart to fall into Bonnie Sue’s trap. She’s the town flirt. Even though Philip doesn’t know that, he ignores her advances. That endears him to me. He’s a good sport too. He drives that clunker the town mechanic loaned him while he works on Philip’s car. The rickety old thing will barely make it up a hill, but Philip doesn’t complain. He takes it all in stride. He’s persistent too. When he lost his client’s million dollars, he was determined to get it back. P: Eve is the most gracious woman I’ve ever met, and the kindness in her eyes tells me beauty lives inside her as well as outside. She’s hot. Spending time with her is as good as a day on Narragansett Bay, which is where I go to relax. The first time you saw her/him, what did you think? E: The first time I saw Philip I noticed how handsome he was and he seemed kind. P: The first time I saw Eve I thought she was attractive and very calm considering I’d rammed a car into her beauty salon. Did you like her/him immediately, or did she/he have to grow on you? E: No, Philip had to grow on me. I feared he would leave and forget about me after he landed the brokerage account, so I didn’t admit it to myself when I did start to fall for him. Also, I still loved Jordan. P: I knew immediately Eve was special and I wanted to spend my time in Triville with her. However, when she broke up with me I realized our relationship went much deeper. Actually, the way my stomach felt, at first I wasn’t sure if I had food poisoning, or if it was love. What would he/she hate people to know about her? E: Philip would hate for anyone to know how nervous it made him driving the old loaner car until he realized it would chug up the mountains. P: Eve hates using store bought beauty supplies. It took some convincing for me to make her realize her customers came to her for her wonderful hairdos and not the products. E: The pot roast in Bob’s diner with sweet tea. P: Eve’s brownies. They edge out Bob’s pot roast, but just barely. If you had to fight, what would be your weapon of choice and why? E: I’d talk my way out of the fight. Talk was all I ever did with my beauty supply salesman, Durbin Brown, and if I ever wanted to hit someone, it was Durbin. E: I agree with Eve. I’m not much of a fighter. P: I’ve grown accustomed to Coca-Cola in New York. E: I love my sweet tea. P: It depends. If it’s lunch, tea, but if it’s dinner and I’ve enjoyed a great meal, nothing tops it off better than dessert and coffee. E: I’d love to ride an elephant. E: I like good music. It can be good country, pop or classical like Jeffrey played in the Blue Room when I went there with Philip. What would you like on your epitaph? E: I’m too young to think about that. P: Me too. Eve and I have lots of living to do. 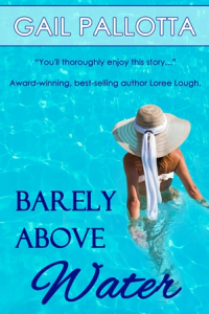 Gail is also offering a free copy of Barely Above Water to one commenter. Great interview, Gail. It is so much fun to hear from your characters. And I love your title! Hi Barb, Thank you for stopping by. I'm glad you enjoyed the interview. Thanks for having me on your neat blog. Hi Gail, I just love character interviews! So cool to hear their voice in that way! And I've already told you how much I love your title! Good luck with your release! Sorry I'm late visiting - had internet trouble last night. Good luck and God's blessings to you both! Hi Kelly, Thank you. The character interview was fun! Hi Pamela, Thank you! Ouch, sorry about the internet trouble. It can be such a bummer.